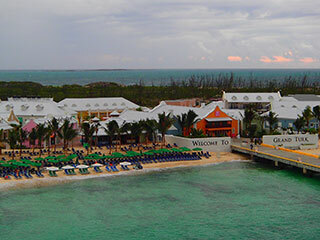 The port at Grand Turk is ready to welcome cruise visitors. 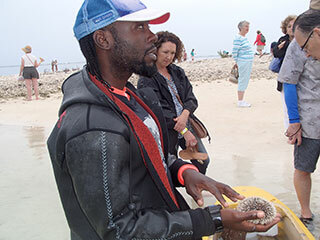 On Grand Turk, Ronald Parker of Oasis Divers shared his love of sea creatures. Considered one of the Caribbean's most beautiful, the beach at Magens Bay on St. Thomas has reopened to sun-worshippers. 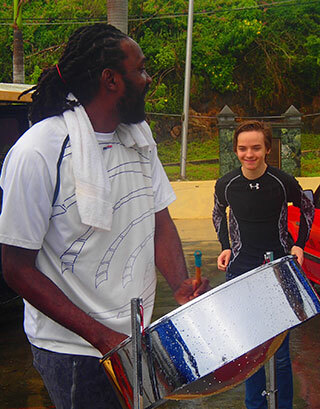 Neil Parkinson enjoys the sweet sounds of the steel pan in St. Thomas. OJ's Bruce Parkinson with St.Thomas driver and guide Winston Rollins. Open Jaw is cruising on Holland America’s Eurodam this week, with a dual purpose. The most important, from a reader’s perspective, is to take a look at a couple of the Eastern Caribbean ports that were hit with the one-two punch of successive major hurricanes in September – Irma and Maria. 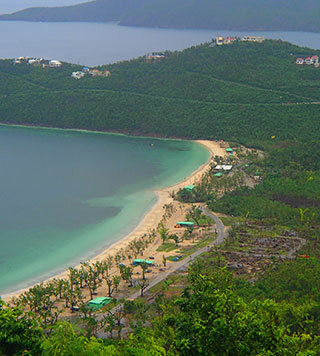 Many booked and prospective cruisers are no doubt wondering whether they should give the Eastern Caribbean a pass for now, while the islands recover. I wanted to get a deeper perspective on whether the passenger experience is compromised. The second purpose, from my own admittedly selfish viewpoint, is to experience a HAL cruise for the first time, despite the fact that I’ve written about the line for years and travelled to multiple press announcements in Manhattan and Alaska. 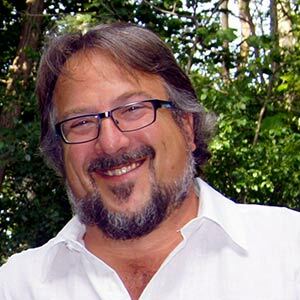 At those events, I have witnessed the rapid evolution of onboard offerings and innovative partnerships for the 140-year-old company, under the leadership of Orlando Ashford, a cruise executive I admire. Adding to the pleasure of my first HAL sailing is the opportunity to travel with my 16-year-old son Neil, who has singlehandedly lowered the average age on this journey. But he enjoys the company of older people, and they’ve been enjoying his too. Back to the first purpose. On this cruise, Turks & Caicos and St. Thomas are among the port calls. Both were hit hard twice within three weeks in September. Both have worked very hard to make ports and attractions ready for peak Caribbean cruising season. When we pulled into Grand Turk, it was hard to tell at first that the archipelago had seen better days. Essentially a collection of limestone outcroppings surrounded by deep ocean, Turks & Caicos is known mostly for its superb beaches and underwater opportunities. That hasn’t changed. The port looks good. It takes a few minutes to realize that almost all of the palm trees in the port area are recent transplants. Debris has been cleared, massive deposits of sand removed and the port shopping area is open and ready for visitors. There was a good selection of shore excursions available, most of them water-focused. We chose a clear-bottom kayaking excursion and nature hike offered by a company called Oasis Divers. After a bumpy ride across the island we arrived on the shore of a saltwater ‘creek’ and met our guide Roland Parker, a multiple-generation native whose spouse is currently working as a nurse at a hospital in North Bay, ON. It was low tide, so the creek was pretty shallow, and to be candid, there wasn’t a whole lot to see through the clear bottom of the two-person kayaks. But Roland’s charm, intelligence and curiosity about the subtleties of the natural environment made the experience come alive. The dozen or so HAL pax who chose the excursion were not disappointed. One of the highlights was a kayak full of water and natural specimens from the creek, including lobster, crabs, conch, sea urchins, sea cucumber and others. He showed us each and told us about their unique properties. It was fascinating. Roland also told us interesting stories about the islands of Turks & Caicos and their people, including the fact that his grandparents were from Middle Caicos, which he called “the land of the immortals.” His grandparents lived to be 109 and 113, so HAL guests could be enjoying Roland’s work for decades to come. After a port call in Cap Cana, D.R. was cancelled due to heavy swells and the difficulty of tender transport, we spent a second day at sea before heading to St. Thomas, USVI. I had visited the island on another ship in May of this year, and it was a little easier to recognize that it had taken a pounding. The lush hillsides are greening up again about six weeks after Maria, but there remains a denuded look, that became more visible ashore. But again, the port at Charlotte Amalie is up and running. By afternoon, when the sun made a welcome appearance, the bars and restaurants were full of cruise revellers and the multitude of jewellery stores were presenting their shiny wares. 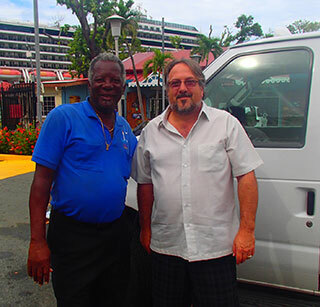 Neil and I hired a cab and driver in the person of Winston Rollins, originally from St. Kitts, but who has lived on St. Thomas long enough to experience Hurricanes Hugo and Marilyn as well as Irma and Maria. His own home was badly damaged, and he’s still waiting for FEMA assistance to repair his roof. Rollins took us just about everywhere on the island. The damage done by the storms was impossible to miss, with hydro crews from across North America still working hard to restore power and the Carnival Vista that was chartered to house relief workers still docked at the container port. The island’s lagoon is cluttered with damaged and sunken sailboats and yachts, and travelling to the heights made clear the extensive roof damage – blue tarps are ubiquitous. Of the many hotels on St. Thomas, only a couple are able to welcome guests at this point. But there are clear signs of progress. The wonderful beach at Magen’s Bay where I had spent a few hours with a group of The Travel Agent Next Door folks in May has recently reopened, and the sandy strand and turquoise water is as beautiful as ever, and new palms are replacing downed trees. We also visited Mountain Top, the peak of St. Thomas, where the store that claims to have served 10 million banana daiquiris is blending and pouring again. We also made a stop at the outlook above the beach, where a talented steel pan player brightened the day with his smile and sounds. As to the second purpose – experiencing Holland America – that has been a real pleasure. The quality of food and service is exceptional. An Asian meal at Tamarind was heavenly, and an evening at Pinnacle Grill was well worth the supplement. The casual Lido Market offers a wide array of choices at every meal and it has all been delicious. We thoroughly enjoyed an evening at BB King’s Blues Club, where the Memphis players were first-class. The Lincoln Centre chamber musicians were excellent as well. And, it must be said, Neil has consumed an alarming number of freshly-baked chocolate chip cookies which he gives two thumbs up. We’re enroute now for a day of play at Half Moon Cay, before taking a leisurely run back to Fort Lauderdale. Judging from the current volume at the Sea View Pool bar, our fellow passengers are having as much fun as we are. And dinner reservations await at Rudi’s Sel de Mer, a once-a-cruise pop-up restaurant that is the brainchild of HAL executive chef Rudi Sodamin. Neil would rather have a burger, but I can’t wait. 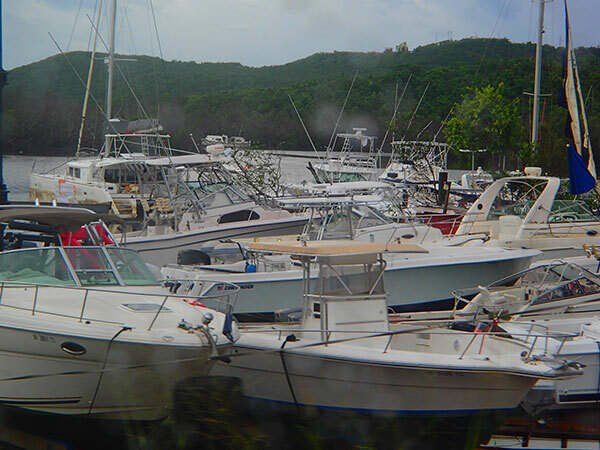 Hundreds of boats were damaged or destroyed on St. Thomas by hurricanes Irma and Maria.